Look ravishing in these blue beauties. These faceted Simulated Sapphire earring drops feature a striking 10mm round crown blue Simulated Sapphire CZ as the centerpiece. These omega clip earrings are accented with dazzling marquise and round CZs around the border. These items have a delicate wearing feel, and post backings to ensure security and functionality without sacrificing style. 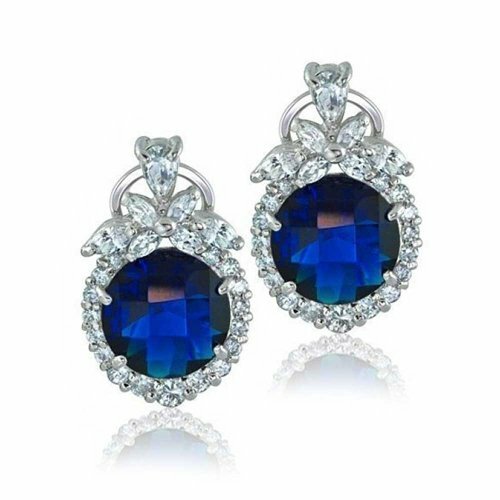 You will feel like absolute royalty wearing these magnificent blue CZ Simulated Sapphire earrings. Perfect gift for those with September birthdays. For pierced ears only. Mesmerize in our sumptuous, sterling silver plated, omega clip earrings. Accented by an impressive 10mm, simulated sapphire cz center stone, adorned with marquise cut and round cz's. Lovely September birthday option.